Cardiology treatment devices across the globe is witnessing a paradigm shift from traditional coronary artery bypass graft surgery to minimally invasive surgeries which facilitates reduced hospital stay and quick recovery. Interventional cardiology devices are minimally invasive devices used for the diagnosis and treatment of coronary artery disease and other cardiovascular diseases. Thus, the growth of the market is anticipated due to rising incidences of coronary artery disease such as acute myocardial infarction and angina pectoris. According to the Centers for Disease Control and Prevention (CDC), coronary heart disease accounts for 370,000 deaths in the U.S. each year, and around 1 individual in 13 suffers from CAD. Decrease in average selling price (primarily drug eluting stents) and lack of efficient reimbursement system are the prime reasons projected to restrict the market growth to a single digit. Geographically, the interventional cardiology (IC) devices market has been segmented into seven major regions: North America, Europe, Asia-Pacific, Latin America, Middle East and North Africa, and Rest of the World. North America held the largest share of 37.4% of the global interventional cardiology devices market in terms of revenue in 2013 followed by Europe. The dominance of these two regions was majorly due to hospitals in these regions are increasingly adopting premium priced innovative products and rising number of patients diagnosed with coronary artery disease. In North America, the U.S. accounted for majority of the market share due to presence of leading manufacturers in the region and high awareness about coronary angioplasty. Coronary stents account for over 60% of the interventional cardiology devices market in the U.S. in terms of revenue. According to the Centers for Disease Control and Prevention (CDC), in 2010, 454,000 coronary stents were used in patients suffering from cardiac artery disease and 1 million cardiac catherizations were performed. However, the region is anticipated to witness slow growth due to market maturation and steady growth in percutaneous interventions. In Europe the number of coronary angioplasties varies significantly among the countries. Germany, Austria and Belgium witnessed highest number of angioplasties in 2010, while the U.K., Poland, and Romania recorded lesser number of these procedures. However, regions such as Germany and Belgium would witness steady growth in the future due to market maturation. Hence, growth in Europe would be emerged from the U.K., Poland, Hungary and others as interventional cardiology procedures become more widespread in these countries. According to the National Audit of Angioplasty Procedures, in the U.K. in 2010 the number of PCI has almost doubled as compared to 2002. Furthermore, significant investment by the National Health Service in the U.K. for effective management of cardiac disorders is positively impacting the number of angioplasties, which would in turn driving market growth. On the contrary, overall Europe interventional cardiology devices market is anticipated to witness sluggish growth as governments of most of the countries in Europe are focusing on price reduction strategy. China and India are the major markets in Asia-Pacific that exhibit immense opportunities for interventional cardiology device manufacturers. According to WHO, around 230 million people in China were diagnosed with cardiovascular diseases in 2010, and these diseases accounted for 37.8% of all the deaths in the country. Hence, China offers significant opportunities for interventional cardiology device manufacturers due to rising prevalence of coronary artery disease and other comorbidities such as diabetes and obesity. The local players in China have leveraged the advantage of low cost product price. MicroPort Corporation, Lepu Medical Technology Co. Ltd., and Biosensors International are the major domestic players in the drug eluting stents market in China that hold over 76% of the market, with MiocroPort dominating the market. 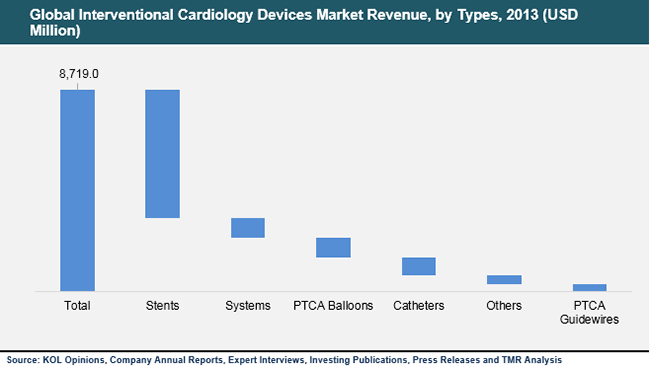 Boston Scientific, Abbott Laboratories, Medtronic plc, St. Jude Medical, Terumo Medical, Volcano Corporation, and Reva Medical are the major players operating in interventional cardiology devices market. Boston Scientific was identified as the leading player of global IC devices market in 2013, accounting for a revenue share of more than 20% followed by Abbott Vascular and Medtronic plc.